With all the FDA has on its plate these days, including meeting court-ordered deadlines for implementation of the 2010 Food Safety Modernization Act (FSMA), it came as a surprise to many when the agency recently issued a notice tentatively determining that partially hydrogenated oils (PHOs) are not generally recognized as safe (GRAS) for use in food. 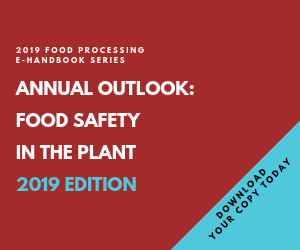 FDA's concern focuses on trans fats, which are produced in the manufacturing process for PHOs to help increase the melting point, shelf life and flavor stability of the oils. Although trans fats exist elsewhere in the diet to some extent, PHOs are the major source. According to FDA, trans fats may have adverse effects on blood cholesterol parameters that affect the risk of coronary heart disease (CHD), and they may have other health implications that, as FDA acknowledges, are unconfirmed. This tentative determination that PHOs are not GRAS follows a 2003 rule requiring labeling of trans fat content in nutrition labels, as well as various state and local initiatives that have restricted the use of PHOs. John G. Moore is an attorney on the food & drug law team at Venable LLP, Washington, D.C. Contact him at jgmoore@venable.com or 202-344-4592. If FDA's tentative determination is finalized, PHOs may effectively be banned from use in foods unless they are first approved by FDA as "food additives," which would likely be a long and difficult process. Alternatively, PHOs might be allowed under a "prior sanction," i.e. an informal approval issued by FDA or USDA prior to the 1958 Food Additives Amendments. FDA has stated that it does not have any knowledge of such a prior sanction, but it is possible that evidence of a prior sanction exists in industry archives. If evidence of a prior sanction is produced, it could require FDA to go through more formal and lengthy procedures to remove PHOs from the market. If no prior sanction for PHOs is found, then these ingredients are especially vulnerable to FDA regulatory action in that they are not the subject of any specific FDA regulatory approval. Food additives must be approved by FDA regulation. GRAS ingredients, on the other hand, may be deemed suitable for use in food by a "GRAS self-determination," in which a manufacturer makes its own determination that an ingredient is GRAS. FDA has listed or affirmed many food ingredients as GRAS in its regulations, but PHOs are not among them, apart from two infrequently used PHOs: the PHO versions of low erucic acid rapeseed (LEAR) oil and menhaden oil. Nor have the PHOs that are still widely used in food processing been the subject of FDA's voluntary GRAS notification program. Under FDA regulations, the agency may issue a determination that a food ingredient is not GRAS without undertaking formal rulemaking. A PHO ban would have a major impact on the food industry. In particular, products such as donuts, cookies, margarine, microwave popcorn, frozen pizzas, baked goods, frostings and many other foods would need to be reformulated. Certain iconic branded products may never be quite the same, potentially endangering their loyal customer base. FDA has established public comment period through Jan. 7, 2014, which is 60 days from publication of the notice. Given the complexity and significance of the tentative finding, this period might be extended, if requested by stakeholders citing a need for more time to prepare comments. FDA routinely grants extensions of 30-90 days under such circumstances, but will not do so unless it receives one or more specific requests citing valid reasons for an extension. Other possible approaches to addressing PHOs in food, such as setting trans fat specification levels. How long reformulation would take. How can the burden on small businesses be reduced? What other challenges may exist, such as products that cannot be reformulated? Whether there is a "prior sanction" for the use of PHOs in food of which FDA is unaware. Stakeholders who wish to continue to use PHOs should seriously consider filing comments on the rulemaking addressing any of the points above or providing other relevant considerations. For example, should FDA be using its GRAS authority to ban ingredients that are just "not good for you," as opposed to toxic? Would stronger labeling be a better solution? What role should consumer freedom of choice play here? The Federal Register notice, which includes instructions for filing comments, is available at https://federalregister.gov/a/2013-26854.